Before moving to Philadelphia in 1988, Philadelphia for me was a hodgepodge of remembrances dating back to my first visits as a college student during the summers of 1972 and 1973. I was a counselor in summer camps outside Philadelphia, and on weekends off a few of us ventured into the city. Sites that the typical tourist experiences—Independence Hall, Society Hill, Old Bookbinder's Restaurant—still loom large and bring back the exhilaration that I felt—having grown up in a small town in West Virginia—exploring the urban scene for the first time with peers. In the summer of 1976, I again came to Philadelphia, this time to attend a political march. Today, my mind's eye sees the oval in front of the art museum filled with hundreds of ragtag protestors, and I recall that youthful feeling that we could change the world if only there were enough of us yelling meaningful slogans. After I settled here, I began discovering other neighborhoods with interesting pasts. One of my first discoveries after I moved here was the Ninth Street Market. 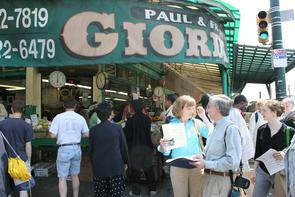 For me, the market's Italian businesses evoked parts of my own past. The aroma and view of cheeses and salumi hanging in DiBruno Brothers educed the dark interior of my maternal grandfather's grocery. The visage and sturdy body of Joe, a Sicilian immigrant, who works there, elicited the image of my preschool self approaching my Sicilian paternal grandfather sitting on a kitchen chair, my nose twitching from the smell of wine on him, kissing him good-bye on a Sunday afternoon. Seeing the strands of linked pork sausage curled in metal pans at Fiorella's Sausage Company conjured my maternal Calabrian great-grandmother's spare coal-camp kitchen, 100 pounds of homemade sausage piled there during her annual fall production ritual. My memories demonstrate how humans embody the places they have experienced throughout life. We absorb them through our five senses and relegate them to the deepest parts of our psyche. They may reemerge when we see, touch, smell, hear, or taste the same place again or experience something familiar about a new place. Place is not something merely physical, but is a collection of everything that happens in the lives of people and things. The power of place lies in gathering all within one sphere of common engagement. This understanding of how we interact with the landscape and built environment and impart significance to it have helped us here at the Historical Society craft a new project called PhilaPlace, which uses the lens of place to look at neighborhoods in Philadelphia. One of those neighborhoods is South Philadelphia, among Philadelphia's oldest, yet historically overlooked, areas. Lying outside Penn's historic grid, it was considered geographically and historically marginal. In fact, it is essential to understanding the history of Philadelphia. Over three centuries, new immigrants settled here because of the affordable housing and convenience to places of employment in nearby factories and in the maritime trades. Today the area continues as a vibrant multiethnic center. However, as economic growth drives up property values, newer immigrants and some long-term residents are threatened with displacement, and stories and sites of the past are fast disappearing. By exploring the role that place plays as a repository of memory and change, PhilaPlace addresses issues of neighborhood change, gentrification, and interethnic relations in the past and into contemporary times. In conducting research for this project, I have come to believe that the market itself is a microcosm of the socioeconomic and cultural change that has occurred in South Philadelphia. Surprisingly, as vibrant and important as the market has been and continues to be, it has not been the focus of much research. 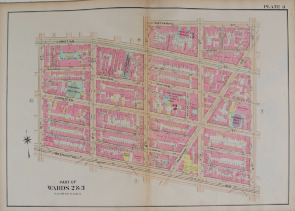 Here is what we can document: The historical heart of the market is the area of Ninth Street between Christian Street and Washington Avenue, but it also encompasses blocks to the north and south of the main strip and Eighth Street to the east, blocks that reflect the changing ethnic composition of Philadelphia via the commercial landscape. The Ninth Street Market is one of the nation's oldest continuous open-air markets, dating to the turn of the 20th century when Italian immigrants sold fruit, vegetables, and meats from carts and stands. From initial oral testimony, we have learned that the vendors went to the docks each morning to purchase foods wholesale and then headed to Ninth Street to sell to neighborhood residents. Situated amidst a major manufacturing area, the market maintained late hours to accommodate late-shift factory workers. As the vendors could afford to, they purchased properties, which allowed them to achieve more permanence and also expand their businesses. 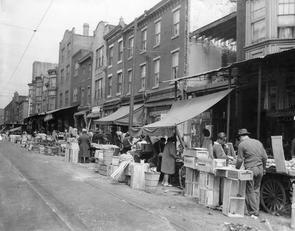 Although it was once the social and commercial heart of the Italian community, the Ninth Street Market was an ethnic mix from its inception. 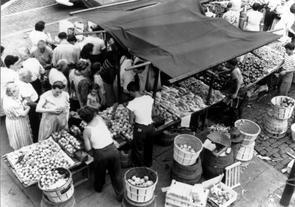 For much of the 20th century, Jewish vendors sold fabrics and household items alongside the Italian-owned produce stands. Using census data and Geographic Information System (GIS) mapping techniques, University of Pennsylvania student Shimrit Keddem has been able to show clearly the patterns of change in terms of ethnic make-up of households and property ownership from 1880 through 1920. 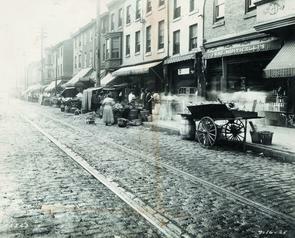 Residential patterns changed dramatically on Ninth Street during this period. By 1900, the Irish, Germans, and African Americans were being replaced primarily by Italians, Jews, and a few "Syrians" (who, based on what we know about immigration patterns, were probably Christians). Using census data and city directories, we traced a few specific properties over the same time span, illustrating on a personal level the ethnic transformation of Ninth Street. For instance, the 1880 census shows that Nicholas Glenn, an Irish immigrant, lived at 1006 S. Ninth. 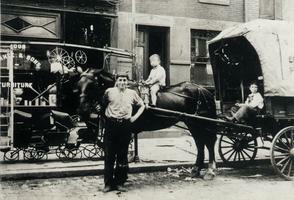 He was an upholsterer and had his store, E. P. Glenn & Brother, at the same address. His wife, Mary, was born to Irish immigrants. The census does not reveal if the Glenns owned or rented their property. A few doors down at 1009 S. Ninth lived Annie Finnegan, another Irish immigrant. By 1900, Guiseppe Fratanduono and his wife, Emilia, were living at 1006. Guiseppe, with Raffaele DeAngelis, who lived at 1034 S. Ninth, was a macaroni merchant at R. DeAngelis & Co. at 921 S. Seventh Street. Both Guiseppe and Emilia were Italian immigrants, and they rented the property and took in two Italian boarders. Syrian immigrants Elias and Heseny Joseph, a husband and wife, lived at 1009, which they also rented. Elias was a salesman. By 1910, an Italian immigrant couple, James Campallone, a laborer, and his wife, Maria, had replaced the Syrian renters. The Campallones may have kept boarders to make some extra money, as a Russian and a Polish immigrant are also listed at the same address. Domenico Fante, whose occupation is listed as "furniture," had purchased the property at 1006 S. Ninth. He and his wife, Carmela, both aged 56, were also Italian immigrants. Domenico was the founder of Fante's Kitchen Wares, which is still a thriving business at the same location on Ninth Street. Stories corroborate the archival record, which shows that by the early decades of the 20th century Italians and Jewish residents were living and working side-by-side on Ninth Street. Paul Giordano, who is an owner of Giordano's Produce on the corner of Ninth and Washington, has described the colorful life in the market that he remembers as a child growing up in the 1930s. He was the youngest child of a large family, which lived above the store. His mother, Frances, was the business head in the family. According to Paul, it was she who had the foresight to buy one property and then adjacent ones, adding another one as the family could afford it. Since Frances worked long hours in the store, she needed someone to help her with childcare. The children's nanny was an immigrant Jewish woman who spoke no English. As a result, all the children were fluent in Yiddish, Sicilian, and English. These interethnic ties are confirmed by similar stories from several other people. I was born [in 1933] in the neighborhood . . . little street called Ellsworth Street, right across from the George Washington Elementary School, which of course still exists and is doing a pretty good job of educating youngsters. I guess I moved a block and half to Carpenter Street [in 1945]. But moving that block and half—anyone who knows South Philadelphia, or knew South Philadelphia in those days—moving a block and a half meant that I moved into a different world. The world that I lived in, or was born in, was an Italian neighborhood, and, it was an Italian neighborhood, therefore I was Italian. And folks who lived in that neighborhood, you were in that neighborhood, and that's just the way it was. There were little Jewish folks living in that immediate neighborhood all over there, and certainly, around the area. There were no Irish folks living in the neighborhood. There were just us Italians. And there was only one other black family [and relatives of mine] that lived in our Italian neighborhood. But a block and a half away, there was an African American—a growing African American community, and so when I tell you that I moved from Fifth and Ellsworth to Fifth and Carpenter, it was only a block and a half away, right across Washington Avenue, I moved into a completely different neighborhood, with a different set of ideas and a different culture, and it took a little time getting used to being an African American when I had been Italian all my life. And I say that advisedly, because I certainly learned a lot about people in my early years because after all, this was during, right after, I guess, the end of the second world war . 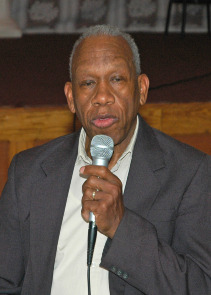 . . Later on, I spent many years on Carpenter Street, eventually returning to the neighborhood as a school principal of one of the neighboring schools, the McCall School. Now, the neighborhood in Southwark as I knew it was far different than it is today. You see remnants of the same people. There are folks that I can remember in the neighborhood from years back, but they live in different housing, some of them, their culture has changed also . . . African American folks in the neighborhood who were around since the '20s, '30s, and '40s—probably see an awful lot of middle-class white folks as being immigrants to the neighborhood. The African American community ran normally from Front Street, or I should say Second Street, over to about Sixth Street, [and] from south of Washington Avenue all the way up to Pine Street. 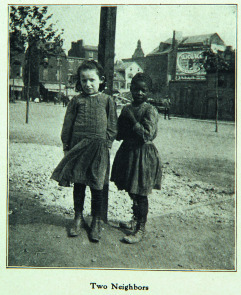 And, of course, where Society Hill is today, that was a predominantly black neighborhood, [a few] Irish folks years back. Lombard Street, before the Crosstown Expressway started, was predominantly African American throughout the '40s and '50s, and I think at this point, you probably won't find one native black family to that neighborhood. As I think back, there were individual neighborhoods. Of course the Italian neighborhood—that was across Sixth Street. The Irish neighborhood—that was from Third, Second and Third back, and the Polish neighborhood just a little south of that, and of course, throughout that entire area was a Jewish community. Fourth Street—if you have the opportunity to ride up and down Fourth Street, South Street, that was certainly a highly developed Jewish neighborhood. I can't tell you how many times—I started to say, "stole" fruit from the stands, but I should say "liberated" from the stands. I think about Ninth Street, the Ninth Street Market, there was a time when [Giordano's] used to stack boxes of grapes from Ninth Street almost to the corner of Eighth Street during wine season. And you couldn't, as children, we couldn't count it at all, but what we could count were those grapes that we liberated from the boxes. Along Washington Avenue there were train tracks that ran from the river to the river, and it was one of the highly developed transportation systems. Much of the cargo that was taken off the ships at Front and/or Delaware Avenue and Washington Avenue were carried in the box cars up to the river for distribution throughout the country . . . We played on the trains and the train tracks. We also built fires, we cooked the grapes that we liberated from [Giordano's] boxes. We ate on Washington Avenue the white potatoes that we also liberated . . . As I think back, I cannot call them the happy times, because certainly we were just coming out of the Depression then. I didn't realize it was a depression, but I knew that most of the folks who lived around me were [like] ourselves—poor. You actually just heard from one Italian, so you're probably going to hear from another one. I came . . . Well, it doesn't help that my naturalized name is actually Tony. I grew up in South Philly. My family came in 1975, when I was nine years old. We were the first Southeast Asian family to settle in that area. I think there was some study done that we were the only family within a two or three mile radius in South Philadelphia in 1975. We came as a direct result of the war that happened in Vietnam . . . 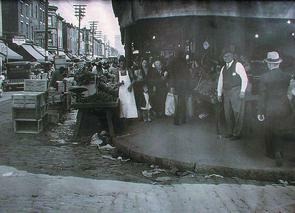 When my family first came to South Philly, S. Seventh Street was basically a bustling business community . 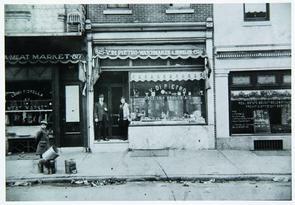 . . [I]t was mostly Jewish-owned businesses. But we were perhaps at the epicenter of some very, you know, South Philly is very divided. You walk from one block to another and the neighborhoods change, and change drastically. Recently I've heard someone describe Philadelphia as not neighborhoods but as a collection of tribes living next to each other. So, my family grew up on Seventh and Wolf. The immediate area was mostly Jewish. You walk two blocks west, you're in an Italian neighborhood. You walk two blocks east of it, you're in an Irish neighborhood. You walk two blocks north, you're in an African American neighborhood. You walk northeast, you're in a Puerto Rican neighborhood. So, here I was, just, you know, a Southeast Asian and it was very easy to identify with the predominantly Italian community around there. In fact, no one ever [called] me Thoai when I was growing up. They'd call me . . . I walked down the street, was, "Yo, Anthony" or "Yo Ton'! What's up?" . . . And, years later, the question of identity is very interesting to me . . . people may tend to think that identity is something very static and it's singular. Well, to me it isn't, and growing up in South Philly is a clear example of that. 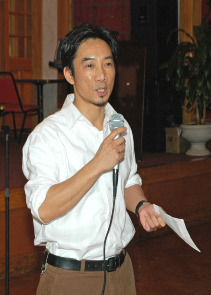 I am Vietnamese. I'm a Vietnamese American. Sometimes I consider myself Asian American—whatever that means. Sometimes I consider myself just, you know, a boy from South Philly, and no matter what country, no matter where I live, I really can't get the South Philly out of me. And when you push me hard enough, I will, you will truly see the South Philly in me . . . I never really appreciated what South Philly is. But years later, I was working for a diversity consulting firm, and one of the celebrations they wanted to have was, "Thoai, can you cook something authentic from your culture to bring to this celebration?" So, I thought about this and, you know, I actually wanted to teach them a lesson, because here's a cultural diversity group that assumed that as a Vietnamese American I would bring in a Vietnamese dish. Well, I didn't. I actually brought in, I think, chicken cacciatore, and when I laid it out on the table . . . but they were actually quite surprised that I came, and I actually didn't explain. And they had to force it out of me that South Philly—that Italian neighborhood where I grew up—is as much a part of my identity as is, you know, me being a Buddhist, or me being Vietnamese, or me having grown up nine years of my life in Vietnam and coming here as a refugee. I arrived in Philly in the fall of '94 as a student actually documenting and [interviewing] Italian dialect variances. And at the time . . . I remember, in fact, looking at the census tract, and my family, well, there were five Mexicans in our census tract . . . So our presence is relatively new. Probably Indonesians as a group are newer than us now, but our influx has come in the last five to six years. I'm an old-timer in the sense that I was, you know, I was a Mexican coming here [that early] . . . [W]e have not settled in any particular spots . . . Many of us work north of Washington, Center City, we tend to live south of Washington, maybe between 2nd and 14th if somebody were to press me . . . We rent from everyone—anyone that'll rent cheap enough. Because in fact, we are a phenomenon of a wave of immigrants . . . For me to represent Mexico is a big deal because I know two other people from Chihuahua, from the north, that live in the area. Most people are from central Mexico where the climate is very mild and therefore the temperament is different. Their language is the most commonly spoken language here, which is Nahuatl, which is Aztec . . . My culture is actually Yaqui, and we're from the coastal areas in northern Mexico where deer abound and running is a pastime . . . And so it's very different for me then to be mingling with so many people from Puebla . . . and the areas around Mexico City where their traditions are very evident . . . You will find in every Italian restaurant and every Italian store [in the market]—I've tested it—if you want to buy your Italian products in Spanish, you can do it; from prosciutto to a particular kind of olive because they are the people handling the back, in a large way, cutting the meat, all kinds of ways. So we are a labor force, we are a contribution, and most recently we are also pretty much in the streets because of the immigration changes that are coming . . . now we're trying to settle into society, of where we fit in the new American society as we're about 10,000 strong here in South Philly. And so we see once again how the ethnic landscape of the market has changed and how this new immigration has colored Diaz's experience of the market and South Philadelphia. Today, although a handful of longtime Italian American–owned family businesses still anchor the strip once dominated by Italian and Jewish business owners, many market shops are now owned by Southeast Asians and Mexicans. These newcomers reflect the changing demographics of immigration to the United States in the last 30 years. Many market facades have undergone a facelift in the last 10 years, but in key ways the street looks like it did decades ago. The market is still a lively and crowded jumble of hawkers loudly advertising their bargains, shoppers negotiating narrow sidewalks packed with overflowing produce stands, flower stalls, and, in the winter, vendors keeping warm by barrel fires. Today, as in the past, customers of all backgrounds come from all over the city—and increasingly, the suburbs—to purchase ethnic culinary specialties and other wares ranging from clothing to handicrafts at bargain prices. In recent years, new upscale restaurants have begun to cater to those who come to experience the market perhaps more than to purchase its goods. Most tourists who visit Philadelphia never see much past the historic area that I visited decades ago. This is not unusual for large cities with rich histories. What casual tourist to Washington, DC, leaves the grassy monument and museum mall to visit Frederick Douglass's home in the primarily African American neighborhood of Anacostia? How many tourists make it past the Colosseum to venture into the wonderful small streets of Trastevere in Rome to discover the unnamed trattorie that cater to the local workers? But if one has a penchant for discovery, it is just such places as these that evoke the rich historical and cultural contours of a city. Philadelphia has many such neighborhoods and places for those willing to diverge from the beaten track. The Ninth Street Market and other sites in South Philadelphia are among them. In the last two years—because of my work with the PhilaPlace project—I have come to understand the market in new and significant ways. Historical and cultural details, located in place and time and distinguished by personal experience (and sometimes reminiscence), have given places that were once mere outlines colorful details and new meaning. 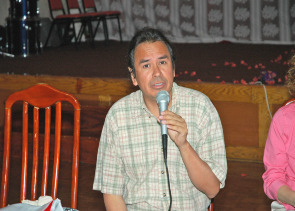 Oscar Hankinson, Thoai Nguyen, and Ricardo Diaz participated in a sharing circle on May 13, 2006, to discuss their lives in South Philadelphia as part of the Historical Society's trolley tour, which was a culmination of a neighborhood planning project that has since grown into PhilaPlace. I wish to thank Melissa Mandell, who allowed me to freely adapt and use portions of her description of the Ninth Street Market; Shimrit Keddem, who shared her research and GIS maps; and Daniel Guilfoyle, our summer 2007 intern from Haverford College, who ferreted out more detailed information on specific Ninth Street properties.